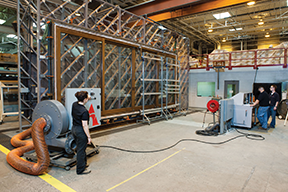 Useful standards for testing the physical performance of windows have been developed over many years, culminating in the North American Fenestration Standard (NAFS). This standard was first published in 2005, with new editions available in 2008 and 2011. Concurrently, testing laboratories have played a pivotal role in verifying building product’s performance according to the standards. 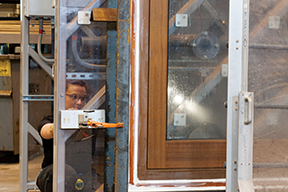 The test methods for fenestration products are quite familiar to manufacturers and have driven product improvements for decades. NAFS establishes minimum and optional performance requirements for windows, doors, tubular daylight devices (TDDs), and unit skylights. The standard was developed jointly under the guidance of the—Canadian Standards Association (CSA), American Architectural Manufacturers Association (AAMA), and the Window & Door Manufacturers Association (WDMA). NAFS is a harmonization of AAMA 101, WDMA I.S.2, and CSA A440, and hence its formal name is AAMA/WDMA/CSA 101/I.S.2/A440–NAFS–North American Fenestration Standard/Specification for Windows, Doors, and Skylights. It is concerned mainly with the determination of performance grade (PG), design pressure (DP), and related performance ratings such as air leakage resistance and water penetration resistance test pressure. NAFS has earned wide acceptance by product manufacturers, testing laboratories, and code officials. Yet, building standards are only as good as they are understood and applied by architects and specifiers—this is particularly true in Canada, where the minimum requirements may be quite strict compared to other regions of North America. The energy efficiency of buildings is important in many climates. NAFS does not deal with energy ratings such as U-factor, solar heat gain coefficient (SHGC), condensation resistance, and visible light transmittance (VLT). However, the physical performance of windows, doors, and other openings with regard to air infiltration and water penetration is intimately related to energy efficiency. 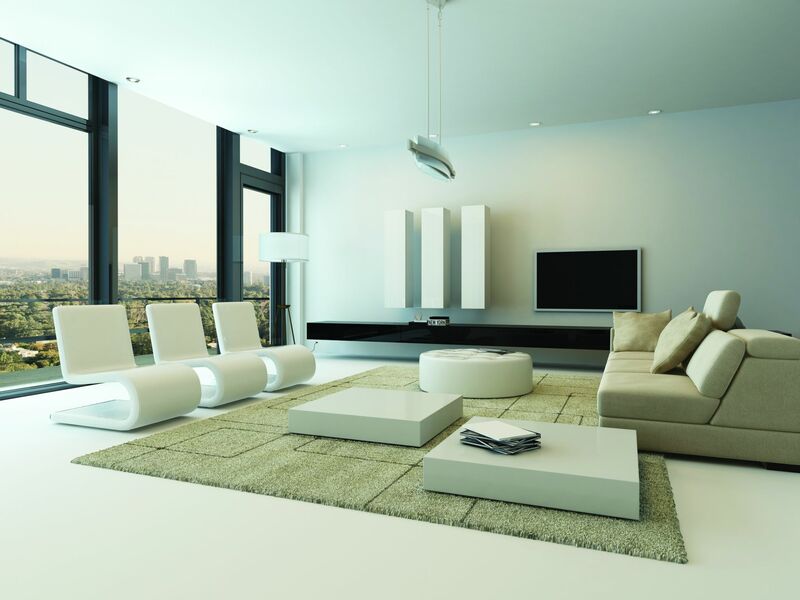 Therefore, it is important to consider the NAFS grades when designing for energy efficiency. Canada updated its fenestration standard to strengthen the regulations on these products by expanding the scope of tests, reworking the product rating system, and specifying additional material and component requirements to provide buildings with added safety and security. When the 2010 National Building Code of Canada (NBC) adopted NAFS-08 earlier this year, the 2012 British Columbia Building Code (BCBC) and the 2012 Ontario Building Code (OBC) opted to incorporate the provisions directly into their own provincial building code as well. NBC requires all fenestration products within the scope of NAFS to conform to the standard’s Canadian supplement, CSA A440 S1-09. The supplement includes added compliance measures as well as several performance and material requirements. It also mandates fenestration products be properly labelled. The updated NAFS requires rigorous testing of fenestration products. The primary test procedures are for air infiltration and exfiltration, water penetration, and structural capacity. Air leakage is expressed in terms of a volume per window area for pre-determined pressure difference. In Canada, A2 is the minimum grade allowed for air leakage, and maximum air leakage is measured for both directions. Water penetration evaluates the ability to resist water penetration at a differential pressure tied to the Performance Grade. Structural capacity is determined by the application of a uniform load. There must be no permanent damage to a window, which must operate freely after testing. Deflection limits are used to determine CW and AW ratings for the top two AAMA 101 performance classes. 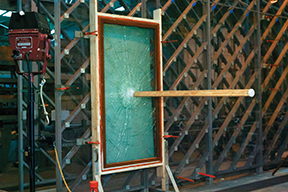 Other auxiliary tests include operation force, forced entry, cycling, and sash and vertical deflection. However, NAFS is not just a testing method. It describes ways to rate and specify windows, doors, and skylights. The Canadian Supplement to NAFS, CSA A440 S1-09, provides product selection criteria through use of geographic, climatic, and terrain parameters. Clear identification of the applicable parameters by local authorities having jurisdiction (AHJ) will be essential for a smooth transition to the new regulations, as well as for manufacturers and building officials. 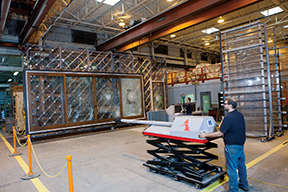 Window, door, and skylight products and their components are tested for air leakage, water penetration, and two separate wind pressure tests designed to measure deflection and blow-out structural failure. Other auxiliary tests include operational forced entry, cycling, and sash and vertical deflection. New to the openings industry is NAFS testing and evaluation of side-hinged door systems. Performance testing for side-hinged doors will now be required and enforced within Canada where regulatory bodies have adopted the standard. Doors can present unique challenges for manufacturers wishing to demonstrate conformance. Unlike windows, their components are rarely shipped as a completed door/frame assembly, but are rather assembled from components purchased from several vendors. The responsibility to demonstrate proof of conformance will lie with the company or individual who applies the NAFS labels to the assembly. In this photo, signs of water leakage are being searched for during a water test for ASTM E331, Standard Test Method for Water Penetration of Exterior Windows, Skylights, Doors, and Curtain Walls by Uniform Static Air Pressure Difference. Once a fenestration product has been thoroughly tested and the manufacturer has ensured it conforms to NAFS and Canadian Supplement requirements, two labels must be affixed to the assembly, including a permanent and temporary marking. The permanent marking will indicate the manufacturer’s name on the label. This must be placed in a location visible when the product is installed, and remain on for the product’s life. The temporary marking indicates the physical performance ratings the product achieved during testing. It also shows when it was issued and lists the “primary and secondary designator,” which can be found on the test report. The primary designator is a one-line identifier indicating the performance class, performance grade, overall size of the tested assembly, and product type. The secondary designator is more specific about the product’s performance. It lists the product’s positive and negative design pressures, water penetration resistance test pressure, and the Canadian air infiltration/exfiltration level. You May Also Like What does COP 21 mean for building professionals? The temporary marking can be removed after the final code inspection has been completed. Manufacturers strongly encourage building code officials to educate themselves about these standards and the product testing procedures involved, since some Canadian provinces and territories have already adopted NAFS and the Canadian Supplement. Building officials should also be able to recognize NAFS labels and requirements for their jurisdiction to ensure product conformance. According to AAMA 450, Voluntary Performance Rating Method for Mulled Fenestration Assemblies, mulled assemblies can also be rated. Mullion ratings for air, water, and structure become part of the test record for the composite units, or mulled combination assembly. In applying this standard, it is important to understand the definitions and the difference between a combination assembly and a composite assembly. A combination assembly is formed by two or more separate windows, window composites, or doors whose frames are mulled together using a combination joining mullion or reinforcing mullion. A composite assembly, on the other hand, is a window or door consisting of two or more sash in one frame with an integral mullion. According to NAFS Section 4.6.1, “Mullion Ratings,” testing the mulled assemblies (including window wall assemblies) qualifies the mullions for use in similar units or assemblies with equal or smaller spans and equal or smaller tributary widths, and in horizontal mullions with equal or smaller supported mass. Clause 4.6.3.2 (“Testing as a Combination Assembly”) of NAFS allows the combination assembly to qualify individual units, according to certain rules. Alternatively, individual units can be tested, with mullion performance tested separately or calculated in accordance with AAMA 450. Consequently, there are three approaches to rating mulled assemblies. The first option is to test the total assembly. An advantage of this approach is it covers mandatory air/water testing. It is also exempt from L/175 criteria, which requires deflections measured under specified loads be limited to 1/175 of the length L spanned by the specimen. With this approach, a PE review and seal are not required and follow-up calculations can be performed for alternate sizes. Disadvantages involve the test specimen preparation, costs, and test lab scheduling. This option appears to be the most logical to follow since air and water testing is required for others, but it should not be undertaken without thorough planning and anticipation of grouping. Option two is to test the mullion element. This approach requires minimal test specimen preparation and cost, and produces more favourable results than the final option. It does require analysis by a professional engineer, and the L/175 limits must be applied. An anchor analysis must be done by a third-party, and this approach requires follow up testing of air and water. This option is best suited for composite mullions that would be conservatively analyzed by Option 3. The third option is the engineering approach. No test specimens are required and it provides a quick and inexpensive evaluation of many profiles. Disadvantages are no credit is applied for partial composite action or polyvinyl chloride (PVC), and the L/175 limits must be applied. An anchor analysis must be done by a third-party PE, and this approach requires follow-up testing of air and water. Option 3 is a valuable component of grouping and is also important for existing testing where optional water tests have been performed. The cannon is primed for the next impact for hurricane resistance testing per ASTM E1886, Standard Testing Method for Performance of Exterior Windows, Curtain Walls, Doors, and Impact Protective Systems Impacted by Missile(s) and Exposed to Cyclic Pressure Differentials, and ASTM E1996, Standard Specification for Performance of Exterior Windows, Curtain Walls, Doors, and Impact Protective Systems Impacted by Windborne Debris in Hurricanes. In summary, NAFS describes the procedures and requirements for determining the air infiltration, water resistance, and structural performance of factory-built or knocked-down-then-field-mulled fenestration assemblies. It presents test procedures and calculation procedures for structural performance and provides a means of grouping mulled fenestration assemblies. new operator types include parallel opening window (POW), roof window, and secondary storm products (SSP). The next updated edition of NAFS is slated for 2017. This hurricane-resistant product is being impacted by three large missiles. Two more will go on this fixed window. While certification is not obligatory for fenestration products to meet building code requirements, many manufacturers do elect to certify their products. Manufacturer certification provides assurance to architects, specifiers, and building owners a product has not only met requirements, but also continues to do so. Since its introduction in 2005, NAFS has harmonized many diverse standards for testing the performance of windows and doors and has become a vital part of building codes in many jurisdictions. As manufacturers and testing laboratories continue to document the performance ratings of their products and specifiers take stock of such information, a superior quality of building construction will become the rule in Canada. 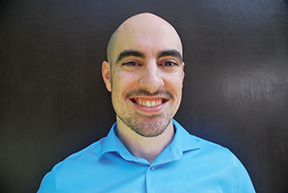 Adam Mantei, EIT, has been an engineer with Intertek’s Building Products Division for the past five years. His areas of expertise include building envelope testing, evaluation, and certification. Mantei manages test programs for physical performance, fire resistance, and thermal transmission characteristics. He served on the board of directors of the Window and Door Manufacturers Association (WDMA) of British Columbia in 2011 and 2012, and is an engineer-in-training (EIT) registered with the Association of Professional Engineers and Geoscientists of British Columbia (APEGBC). Mantei received a bachelor’s degree in engineering from the University of Victoria (British Columbia) in 2009. He can be reached by e-mail at adam.mantei@intertek.com.